One of America's most prominent worship leaders allows us to go on a liturgical journey with him. Out of his experience, Bishop Frederick Hilborn Talbot provides an exciting and useful guide for church leaders who understand that revitalizing worship is central to revitalizing the church itself. 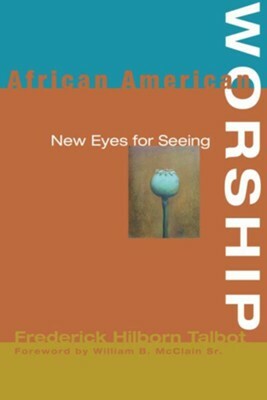 In African American Worship: New Eyes for Seeing, Talbot balances the cultural setting of African American churches and the wider experience of the church universal through the ages. He draws together his own wide and long experience, African background, Caribbean and United States churches, as well as the strong influence of the Wesleyan Revival. Outstanding church leaders, scholars in theology, and pastors commend this exceptional account of the African American experience of worship as a model for the future for churches of all denominations. This is a remarkable and splendid work What is written here ought to be read by every preacher, theological student, and lay person of the Christian church. It is a magnificent account of the African American spiritual heritage. But much more, it is a help for all who seek to plan and engage in authentic worship. We have needed this volume for a long time. I commend this book for serious study and wide application. --Gardner C. Taylor, Pastor Emeritus, Concord Baptist Church of Christ Here is a significant model and impetus for any church seeking both the roots and future of its worship. . . . This is a balanced account . . . centering on the experience of the African Methodist Episcopal Church. He has provided a guide for church leaders who understand that revitalizing worship is central to the revitalization of the church itself. --Catherine Gonzalez, Professor Emerita, Columbia Theological Seminary What a book This scholarly, yet engaging book should become required reading for all African American students in the Schools of Divinity. After artfully sharing nuggets from the gripping story of his journey from British Guyana to Allen University, Yale University, and beyond, Bishop Talbot extracts some soulful fundamentals of African American worship. Many of all Christian groups will discover in this work new eyes for seeing, new ears for hearing, and a new heart for feeling the very presence of God in worship Get this book --Bishop Frederick James, Retired, African Methodist Episcopal Church As one touched by his ministry as a Bishop greatly concerned about the worship life of congregations, I can attest to the depth of his interest in sharing a new vision for the liturgical life of the AME Church in particular, and the ecumenical church in general. I highly endorse and recommend African American Worship: New Eyes for Seeing. Without a doubt, this document will become a valuable textbook and resource for teachers and students in seminaries. It is written in a such a way that it can serve as a helpful resource for individuals and groups preparing for ministry--pastors, as well as lay persons. --Melva Wilson Costen, Professor, Interdenominational Theological Center, author of African American Christian Worship Frederick Hilborn Talbot is a graduate of Allen University, Yale Divinity School, the Pacific School of Religion, Columbia Theological Seminary, and has been a Resident Fellow at Harvard University. He was elected the ninetieth Bishop of the African Methodist Episcopal Church in 1972 and has also served in the Diplomatic Service of the Government of Guyana. I'm the author/artist and I want to review African American Worship.